Take a look at what our colleagues are reading about us in the latest issue of ScienceWriters, the quarterly magazine for members of the National Association of Science Writers. Thanks to Richard Saltus for the writeup and Dianne Finch for the photos. Carol Cruzan Morton introduces a panel whose online news operations are shaping the future of science journalism. Boston-area science writers who have built online audiences through a variety of strategies and outlets shared their experiences at a January panel discussion sponsored by the New England Science Writers. Making the leap from science writing and editing to the more entrepreneurial world of blogs and web presence requires new ways of doing things, business models, and creative staffing strategies. “You not only have to write the stories—you also have to sell them, over and over,” said Carey Goldberg, co-host of the CommonHealth blog (http://commonhealth.wbur.org) on Boston NPR outlet WBUR. CommonHealth blog became a general health news site in 2010 as part of a grant establishing a dozen blogs at local NPR stations. It covers the intersection of medicine, money and politics, including health care reform, medical innovation, and personal health. The blogging experiment convinced NPR leadership of the value in original reporting that originates on the web, Goldberg said. Bob Buderi, former editor-in-chief of Technology Review, founded the tech business website Xconomy (http://www.xconomy.com) with a focused presence in six major cities. Buderi said he’s succeeded in attracting “underwriters and partners” (rather than advertisers) by offering them access to an “elite audience” of well-educated, high-profile individuals interested in innovation and who want to be associated with the content on the site. Original in-depth content, targeted audience and (paid) savvy editorial management have helped build solid online news operations, according to (from left) Alison Bass, Ethan Zuckerman, Gabrielle Strobel, Carey Goldberg and Bob Buderi. 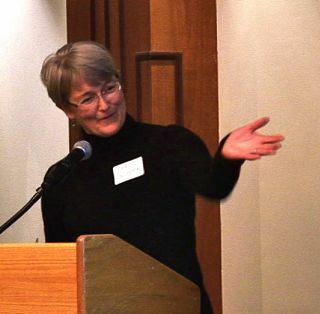 Gabrielle Strobel, executive editor of the Alzheimer Research Forum (http://www.alzforum.org) said that long-term philanthropic support (15 years) has made possible the community of researchers, patients, policy makers, and others that the free site has created. Among other things, it serves as a dynamic exchange of scientific questions and results. More than half of the audience are active Alzheimer’s researchers, most of whom use AlzForum as their home page. The fourth panelist, Ethan Zuckerman, is the founder of Global Voices (http://globalvoicesonline.org), which uses a small, paid staff of part-time editors and scores of volunteer authors from around the world, bringing news and opinion from voices not ordinarily heard in the mainstream media. For example, Global Voices started covering the Arab Spring uprising on Dec. 20, 2010, three weeks before the New York Times picked up the story, Zuckerman said. Though not oriented toward science writing, Global Voices is an unusual model for aggregating content—and doing it with a minimal budget.